Six Sigma is one of the most beneficial methodologies in the pharmaceuticals industry. One of the major reasons why Six Sigma is implemented within the pharmaceuticals industry is that it works in reducing operational costs while also ensuring that the most excellent services are provided to clients. Six Sigma in pharmaceuticals work in supporting highly reputable regulatory bodies including the FDA in US and in reducing the amount of risks and the number of errors especially during the execution of operational and manufacturing processes. A pharmaceutical company usually faces challenges in earning huge amounts of profit due to the fierce competition in the industry and the errors that are committed during the manufacturing stage. As a means of dealing with these challenges, a lot of professionals implement Six Sigma in the pharmaceutical companies that they are a part of as a means of improving the efficiency during the operational and manufacturing stages. With the help of this methodology, all the staff within a company will have an easier time optimizing their resources, decreasing errors and waste and controlling inventory. The implementation of the traditional Six Sigma methodology works in reducing wastes within pharmaceutical companies and bringing in more effective and positive changes in their operations. Instead of just relying on end-process testing, analysis and evaluation, the methodology allows these companies to instantly make close to accurate predictions and eliminate errors right away. This is a huge help in boosting a company’s operational efficiency while also improving the quality of products offered to prospects and ensuring law compliance. 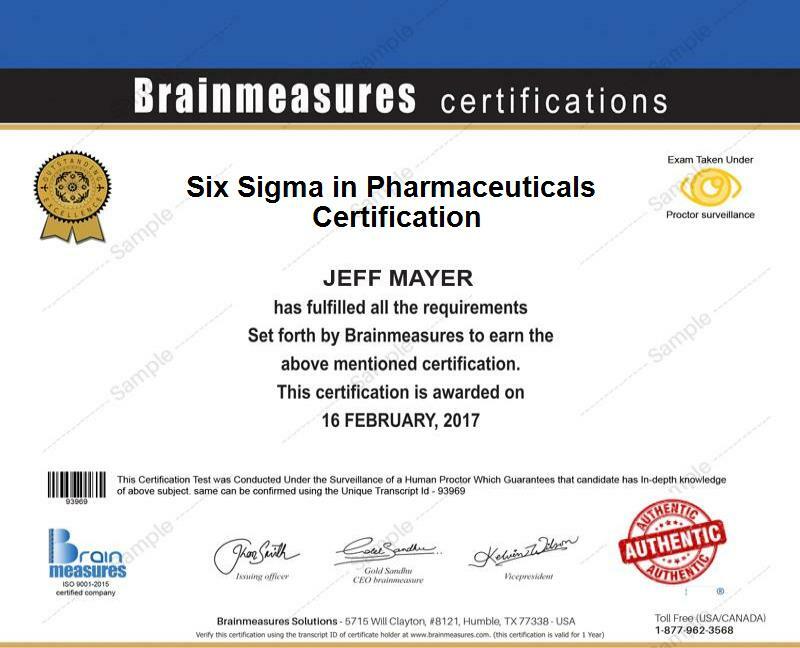 If you want to become an expert in the field of implementing Six Sigma in the pharmaceuticals industry, then be aware that you can achieve this by taking part in the Six Sigma in pharmaceuticals certification program that you can access at Brainmeasures. This Six Sigma in pharmaceuticals course is developed by real experts in the Six Sigma industry so you have an assurance that it can help you achieve your desired level of knowledge about the field. Enrolling in this online certification course allows you to undergo an easily understandable and detailed Six Sigma in pharmaceuticals training which covers all the aspects and issues related to the field, the roles and responsibilities of a Six Sigma professional who works in the pharmaceuticals industry, the laws and regulations associated to the implementation of the methodology and the many techniques and tools that you can use to make this methodology even more beneficial to your pharmaceutical company. After Brainmeasures supply you with your certificate, it will be easier for you to get vital and profitable positions in a pharmaceutical company. Hundreds of individuals and professionals especially those who are working in the pharmaceuticals industry can definitely generate a lot of benefits from enrolling in a Six Sigma in pharmaceuticals certification program. This online certification course can be expected to work more effectively for directors, managers, presidents, vice presidents, executives and other professionals in the pharmaceuticals industry. As a Six Sigma in pharmaceuticals certification holder, you can expect your salary to become even higher because your certification shows your competence and proficiency when it comes to implementing the methodology in the industry. With the help of your Six Sigma in pharmaceuticals certification, working as a real professional and expert in this specific field will become easier. It allows you to enjoy an annual salary within the range of $51,000 to $115,000.